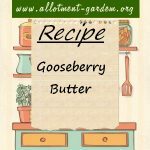 Recipe for Gooseberry Butter. Makes a great filling for sponge cakes and tarts as well as being used as a spread like jam. Makes about 4 lb (1.8 kg). Recipe for Black Currant Butter. Makes a great filling for sponge cakes and tarts as well as being used as a spread like jam. Makes about 4 lb (1.8 kg). Recipe for Damson Cheese. Can be turned out in one piece and cut with a knife in place of cheese or, cut into small pieces, as a sweetmeat. Recipe for Cranberry Cheese. Can be turned out in one piece and cut with a knife in place of cheese or, cut into small pieces, as a sweetmeat. 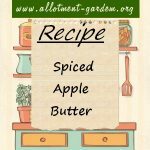 Recipe for Spiced Apple Butter. Makes a great filling for sponge cakes and tarts as well as being used as a spread like jam. Makes about 6 lb (2.8 kg).